The stripes of a zebra are like human fingerprints - each pattern is different. The stripes help to camouflage the zebra and confuse predators. Heat vapours rising from the ground make the stripes appear to move. 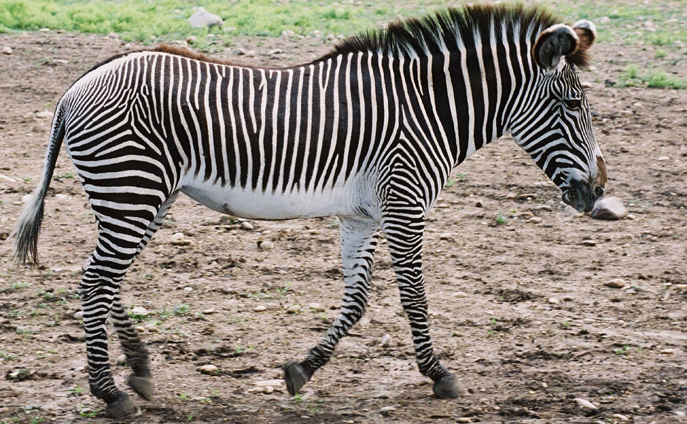 This effect makes it difficult for the predator to target individual zebras. This effect is increased when the group of zebras are running. Male zebra are generally solitary and are known to occupy the largest territory of any herbivore, sometimes up to 12 Km2 . They mark their territories around watering and grazing areas with piles of dung, called middens. Zebras ears are very agile and when “wiggled” communicate danger signals to other zebras. Watch closely to see how their ears move individually. The Grevy’s zebra is the largest of three zebra species with a thick rigid mane and large rounded ears. Although related to the horse, Grevy’s zebras are more closely related to donkeys. Grevy’s zebras are unusual because they do not form lasting bonds like plains zebras and horses. Their group composition changes regularly. Herds are usually made up of female zebras and their young.